Engaging the Concert Audience: My New Book is Here! David Wallace’s “Engaging the Concert Audience” now available from Berklee Press! I am elated to announce the arrival of my Berklee Press book, Engaging the Concert Audience: A Musician’s Guide to Interactive Performance! 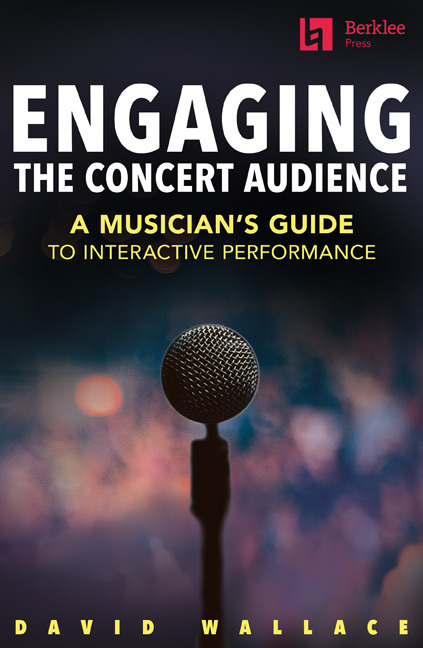 Engaging the Concert Audience is the new, revised, expanded, and updated version of my previous book from McGraw-Hill, Reaching Out: A Musician’s Guide to Interactive Performance. Since its publication in 2007, this critically-acclaimed book has been the music industry’s go-to resource for designing and performing interactive concerts. What’s an interactive concert? It’s a concert where you help your listeners to perform, create, and reflect in ways that enhance their musical perceptions. Your audience engagement skills lead listeners to make personally relevant connections. Older generations may remember broadcasts of educational interactive performances, like Leonard Bernstein’s Young People’s Concerts or Wynton Marsalis’s Marsalis on Music. Of course, pop, rock, R & B, folk, and hip-hop thrive on interactivity, too. Most of us have certainly experienced live interactive performances in a variety of genres. However, knowing how to produce a quality event is another matter altogether. Do I Keep Reaching Out? After Reaching Out sold out its final printing in 2013 and became out-of-print, I pondered its future. Should keep the book alive “as is” via a print-on-demand publisher? Do I bite the bullet, roll up my sleeves, and do a major rewrite and expansion? Because interactive concerts are so experiential, maybe I should dispose of books altogether. What if I just made videos or an interactive app. . .? Meanwhile, used book prices for Reaching Out soared. Every few weeks, somebody would contact me: Do you have any more copies? Can our college license a limited run? You once said you would write a new edition; any news? Why didn’t you talk about the subtleties of performing in hospitals, schools, night clubs, synagogues, or prisons?. . . Although both Angela Myles Beeching’s Beyond Talent and Eric Booth’s The Music Teaching Artist’s Bible had both included a summary and recommendation of Reaching Out, no comparable resources had replaced it. Moreover, the more I reflected, the less content I felt about releasing the same old book. I had learned too much since completing the book’s first draft in 2003. I also longed to answer the questions readers were still asking. After making inquiries to various publishers, Jonathan Feist, Editor in Chief of Berklee Press gave me a green light in May, 2017. It was time to roll up my sleeves. . .
Jonathan liked Reaching Out, but believed we could do better. Superficially, a clearer title and a cover that targeting performers would improve marketing. More importantly, though, he wanted a broader and more inclusive book. After all, my method and advice applies to all performers, so why not expand the target audience? Why not choose further reaching examples, exercises, and repertoire? Engaging the Concert Audience is now a richer book for including more diverse artists and repertoire. Additionally, I was eager to share experiences I had gained since completing Reaching Out in 2003. In the intervening years, I had performed and produced heavy metal shows, stand-up comedy, prison concerts, benefit concerts, and interactive liturgical services. Furthermore, some of my best new scripts, including ones commissioned by the Los Angeles Philharmonic and the New York Philharmonic were still unpublished. Colleagues and I had tackled bilingual and monolingual foreign language concerts, as demand for them has risen greatly. My personal network of artists who engage the concert audience had grown as well. You need to know about the Pittsburgh Symphony’s Music and Wellness programs developed by Penny Brill under the leadership of Suzanne Perrino. If you’re a prospective busker, you should get a master class in street performance from Cajun musician Sean Grissom. (You’ll also enjoy his cogent analysis of why a Grammy-winning musician famously failed in the Washington D.C. Metro). Violinist Rachel Barton Pine has really worked to include entry points in her performances. Her example teaches us how to reap remarkable benefits from critics and audiences alike. Teaching artist Wendy Law’s “remote control game” gives volunteers the opportunity to signal and manipulate your ensembles with a flick of the wrist or the press of a button. Meanwhile, technology continues to expand the way we can interact with our fans and audiences during and beyond the concert. Hal Leonard, owner of Berklee Press, always has copies available at list price ($16.99). Amazon sometimes runs jaw-dropping sales. At the time this posting was written, Engaging the Concert Audience was selling new for $12.59. However, Amazon prices for this book can just as easily soar to $24.00. East Coast Music is an independent internet store run by and for musicians. They were also the first internet outlet to sell my book reliably. So far, they have offered Engaging the Concert Audience at a 20% discount for $13.59. Barnes & Noble is a reliable source for buying this book, and often runs special discount codes. If you have comments or questions about Engaging the Concert Audience, please add a comment!